We have a bunch of Tribe Days with camping options in the calendar for 2019, where the YesBus will be open for all to enjoy whether it is to work, rest or play. Tribe Days are free and space is limited - click here to find out more and book your place. The YesBus was made possible by transforming inspiring dreams into audacious reality, which was largely due to an epic crowdfunding campaign in 2017. After a long summer and countless hours donated by our volunteer crew, we were able to raise £22k, nearly half of the total target of £50k, which would get the YesBus and it’s land transformed and ready for the public. 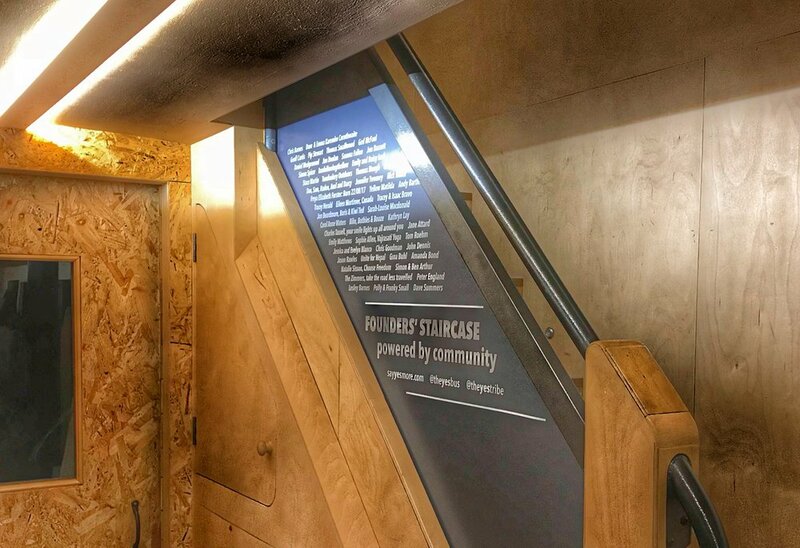 The campaign gave the opportunity for 100 people to donate £100 to become a Founder of the YesBus and leave their mark on the Founders’ Staircase for all to see. 54 people said YES and these generous folk have now been installed on the bus and there’s space for a few more names! Like the founders before you, you too could have your name marked on The YesBus for all eternity. By donating to continue creating this special escape in the countryside, you’d be creating a legacy for many more years to come. Tell us about your idea for using the bus, including dates, content, number of people and questions. If you have a Day Credit for the bus and want to come to a Tribe Day, this is where you let us know. WE'D LIKE TO INVITE YOU TO USE THIS SPACE CREATIVELY. WHY NOT DROP US A LINE WITH A BRAND NEW IDEA? All aboard! Thanks for signing up to the YesBus newsletter.